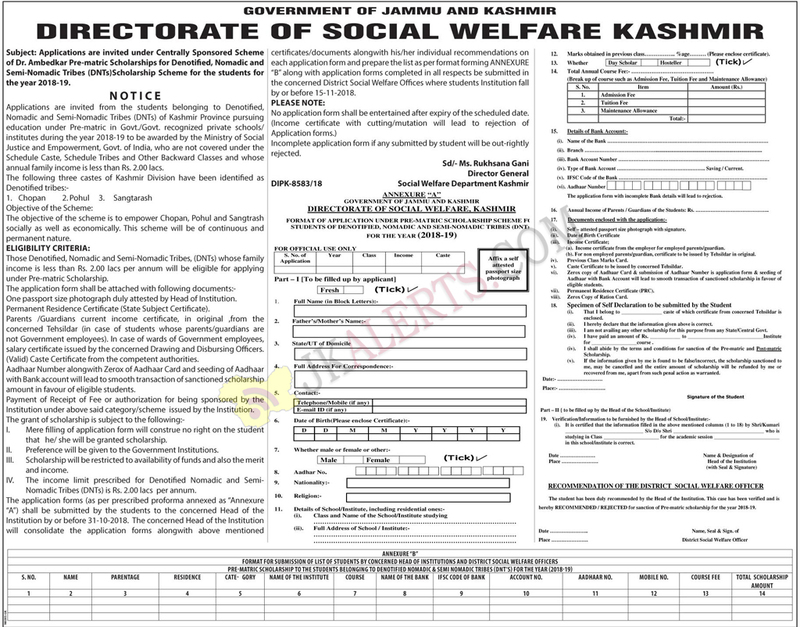 J&K Social Welfare Department Pre-matric Scholarships for Denotified, Nomadic and Semi-Nomadic Tribes (DNTs) Scholarship Scheme for the students for the year 2018-19. Applications are invited under Centrally Sponsored Scheme of Dr. Ambedkar Pre-matric Scholarships for Denotified, Nomadic and Semi-Nomadic Tribes (DNTs)Scholarship Scheme for the students for the year 2018-19. Applications are invited from the students belonging to Denotified, Nomadic and Semi-Nomadic Tribes (DNTs) of Kashmir Province pursuing education under Pre-matric in Govt./Govt. recognized private schools/ institutes during the year 2018-19 to be awarded by the Ministry of Social Justice and Empowerment, Govt, of India, who are not covered under the Schedule Caste, Schedule Tribes and Other Backward Classes and whose annual family income is less than Rs. 2.00 lacs. The objective of the scheme is to empower Chopan, Pohul and Sangtrash socially as well as economically. This scheme will be of continuous and permanent nature. Those Denotified, Nomadic and Semi-Nomadic Tribes, (DNTs) whose family income is less than Rs. 2.00 lacs per annum will be eligible for applying under Pre-matric Scholarship. The application form shall be attached with following documents:-One passport size photograph duly attested by Head of Institution. Permanent Residence Certificate (State Subject Certificate). Parents /Guardians current income certificate, in original ,from the concerned Tehsildar (in case of students whose parents/guardians are not Government employees). In case of wards of Government employees, salary certificate issued by the concerned Drawing and Disbursing Officers. (Valid) Caste Certificate from the competent authorities. Aadhaar Number alongwith Zerox of Aadhaar Card and seeding of Aadhaar with Bank account will lead to smooth transaction of sanctioned scholarship amount in favour of eligible students. Payment of Receipt of Fee or authorization for being sponsored by the Institution under above said category/scheme issued by the Institution. I. Mere filling of application form will construe no right on the student that he/ she will be granted scholarship. II. Preference will be given to the Government Institutions. III. Scholarship will be restricted to availability of funds and also the merit and income. IV. The income limit prescribed for Denotified Nomadic and Semi-Nomadic Tribes (DNTs) is Rs. 2.00 lacs per annum. The application forms (as per prescribed proforma annexed as “Annexure “A”) shall be submitted by the students to the concerned Head of the Institution by or before 31-10-2018. The concerned Head of the Institution will consolidate the application forms alongwith above mentioned certificates/documents alongwith his/her individual recommendations on each application form and prepare the list as per format forming ANNEXURE “B” along with application forms completed in all respects be submitted in the concerned District Social Welfare Offices where students Institution fall by or before 15-11-2018. Incomplete application form if any submitted by student will be out-rightly rejected. For Pre-matric / Post-Matric Scholarship Upcoming notifications Selection Lists and Results update Free Job Alerts and Updates for both Fresher and Experienced Candidates. Keep Visiting Jkalerts.